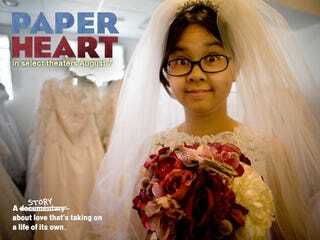 Paper Heart is a mocku- docu-dramedy about real-life funny person Charlyne Yi (Seth Rogen's stoner buddy's giggly girlfriend in Knocked Up) claiming she doesn't believe in love. So she sets out with a director pal to learn what love is. Enter Michael Cera. Enter heartwarming quirkiness with an excellent soundtrack. Enter Paper Heart, which opens in select theaters August 7. Added bonus! After watching this film, you may finally develop a response to the plaintive, immortal words of Huey Lewis (and most if not all of the News): Do you believe in love? Do you believe it's true? Wee-ooh-ooh-ooh-wee-ooh? Paper Heart opens in select theaters August 7. Trailer below!